We've written about our participation on Broadcastr, a new site for location-based audio, and recently added a slew of insider stories about the park. 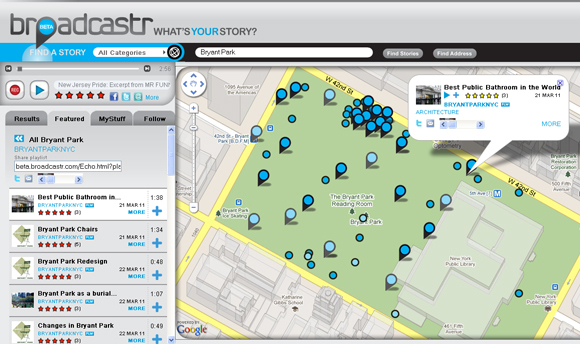 See all those blue tags on the Bryant Park map up there? Each one is an audio file that gives you a behind the scenes story of the park, or an audio clip taken on location beneath the London Planes. ...and Don Bussolini, the longest standing member of our Capital Projects Department, reveals what you probably never knew you were sitting on top of while taking a long lunch on the grass (Under the Lawn). Tip: if you have trouble accessing our stories from the links above, take a few seconds to create a free account and try the links again. Once you have an account you'll also be able to rate your favorite audio clips and record your own stories.